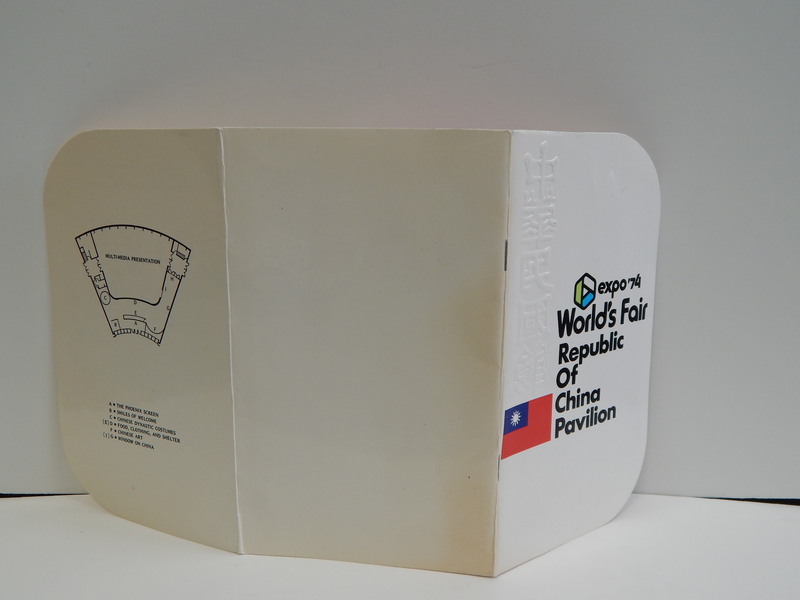 Paper items from Worlds Fairs are just as exciting as the dishes and trinkets you might find. At one sale I found all the brochures, FDC stamp envelope, tickets and what is called a Stamps Document. 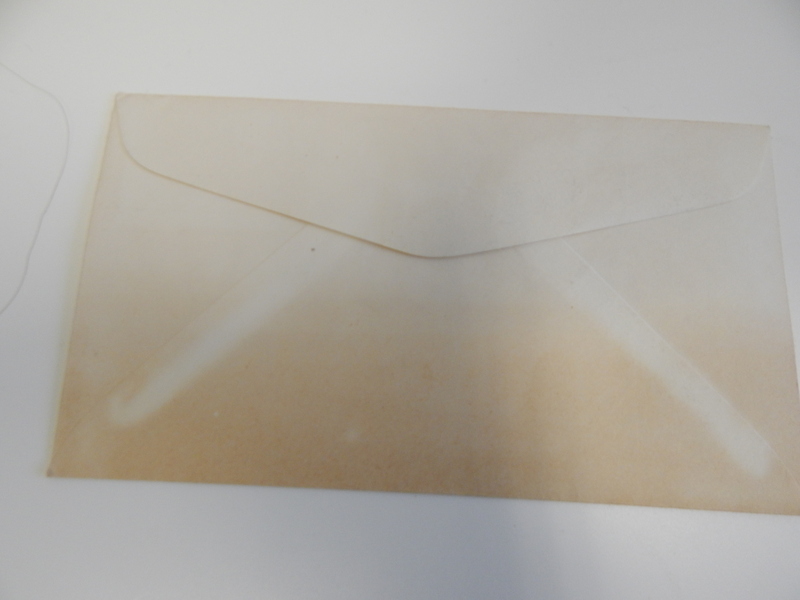 This is a folder and envelope that you can have stamped as you visit the exhibits. In today’s world this seems rather old fashion but look how this preserved this family’s experience. The inside page had places labeled for each countries and as you can see they visited each of them. 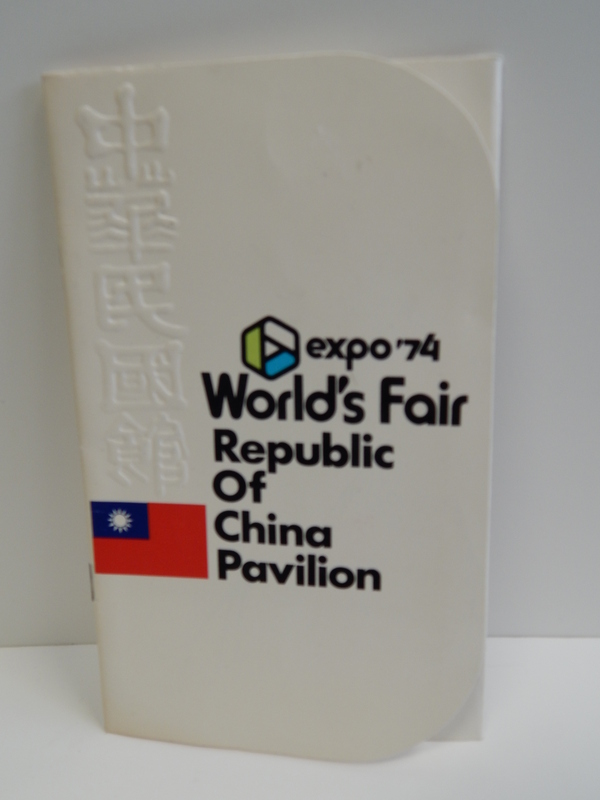 The Expo had Australia, Canada, Republic of China (Taiwan), Federal Republic of Germany (West Germany), Japan, Korea, USSR (Russia), USA, and Iran. They used the envelope that they received the document in to gather more stamps ranging from Oregon, Idaho, Montana, Ford, Amtrak, Litter Exhibit, Whirlpool, Eastman Kodak & AT&T. 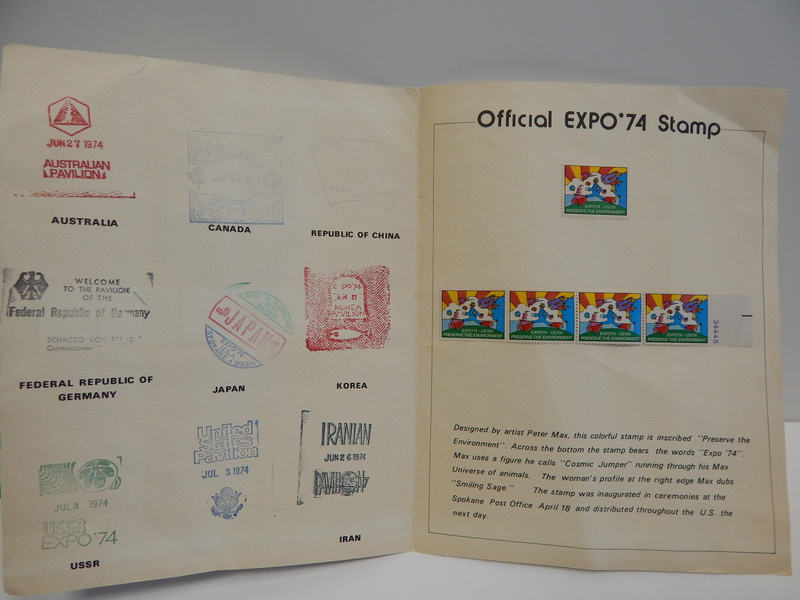 When you open the folder you not only see their exhibit stamps but also the commemorative stamp that was designed for Expo ’74. 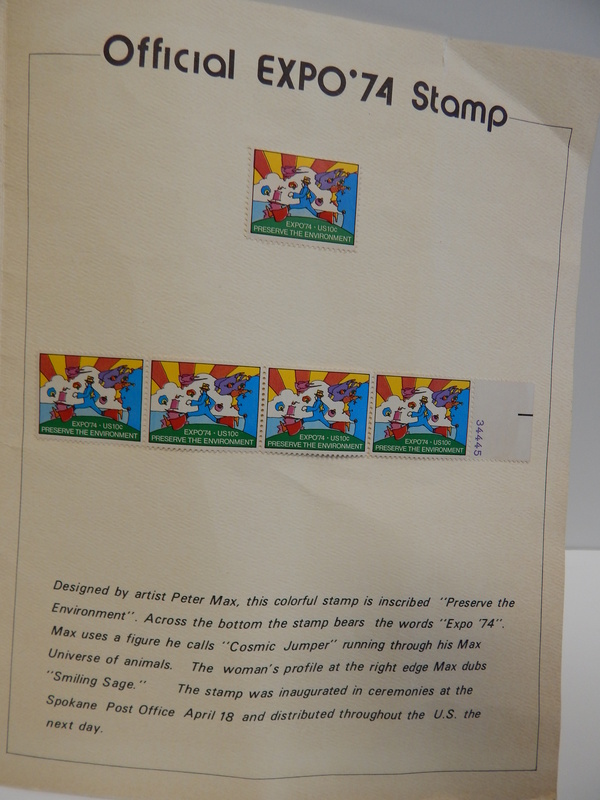 The designer of the stamp was none other than the Peter Max. He is a German-born American illustrator and graphic artist, known for the use of psychedelic shapes and color palettes during the 60s & 70s. 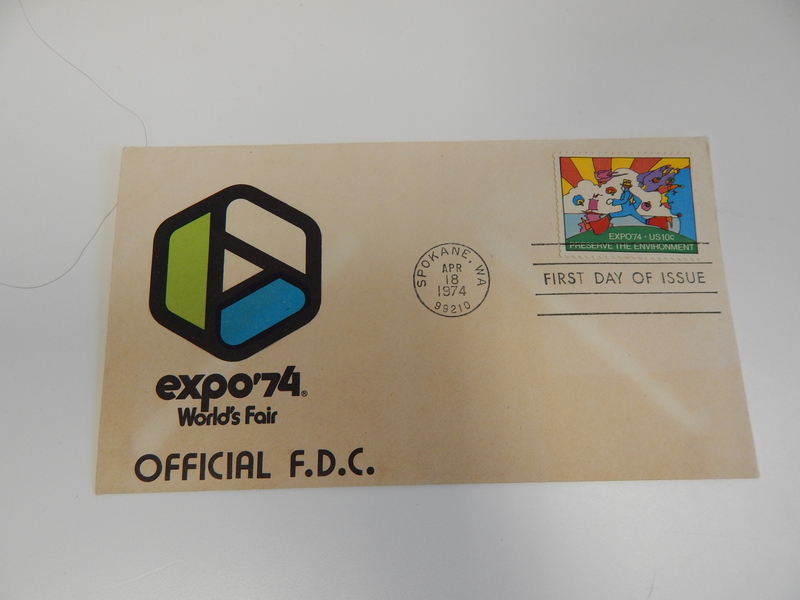 Another memorabilia item from Worlds Fairs are First Day Covers. That is a postcard or envelope with the stamp cancelled on the first day of issue. This treasure trove of items included one of those too. It does not seem that long ago since 1974, only 40 plus years. However, time will take its toll on these kinds of items and they are often thrown out. This group is now safe in my Worlds Fair Mini Museum. 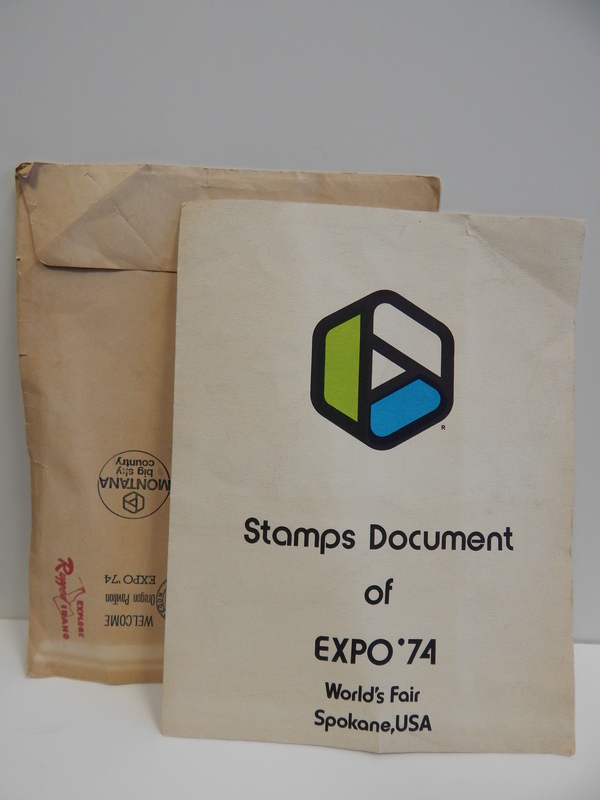 Expo 74 – the little City that could! Spokane Washington was one of the smallest cities to host a Worlds Fair approved by the Bureau of International Expositions. 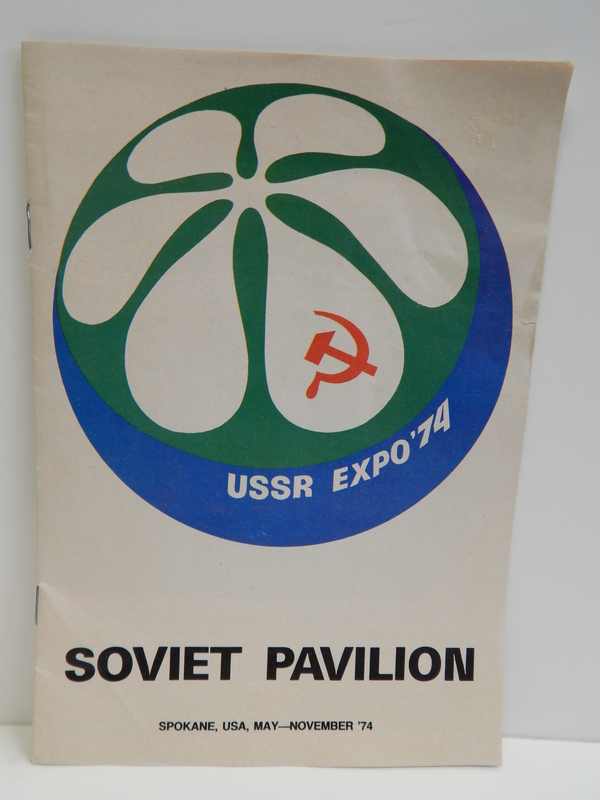 Expo 74 had a slogan of “Celebrating Tomorrow’s Fresh New Environment” and motto of “Progress without Pollution”. It was among the first fair in decades that did not focus on the space age, futuristic themes, or Utopian ideas of living. My collection grew in the last couple of years. Seattle is fairly close to Spokane and there is still a lot of memorabilia floating around. For years there was even new old stock sold at a store in Spokane called the The White Elephant. I just checked online and they bought all 280,000 left over pieces of “Fair Junk”. He made his money back in 3 months and as the article states it was all gravy after that, even to this day. Today we will start with the common Fair item. Teacups!! 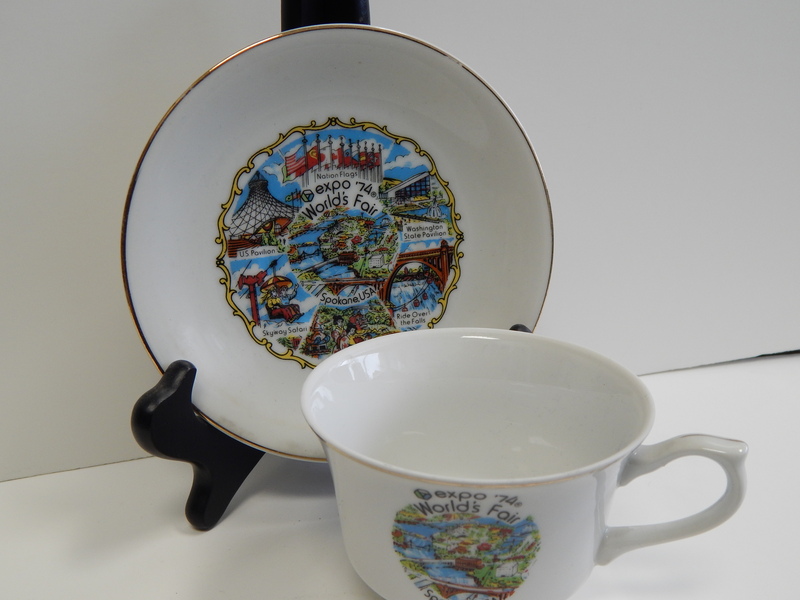 First up is the Tea Cup set with a multi view of the main pavilions and sights of the Fair. The center of the design has the Expo’s overall view. It was located on Canada Island, Havermale Island, and the adjacent south bank of the Spokane River in the center of the city. Around that are depictions of the US Pavilion, Washington State Pavilion, Skyway Safari, Oriental Gardens, the Ride over the Falls and Nations Flags. Of course it had the logo, location and name of the Event too. The second set is much more modern. It has a less old lady style. 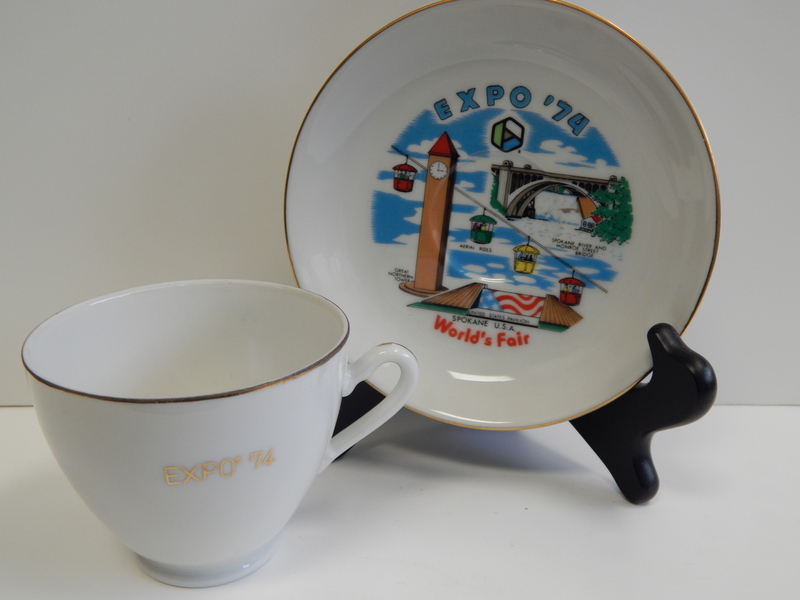 The cup is plain white with just Expo 74 on it. 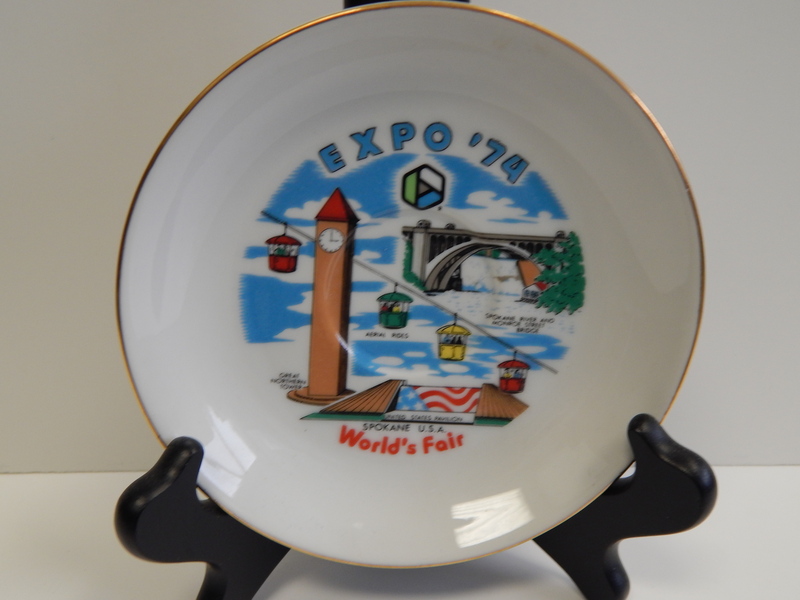 The plate depicts The Great Northern Tower, United States Pavilion, Aerial Rides and the Spokane River and Monroe Street Bridge.